Fulfillment is all the legwork that goes into selling a product: storing the products, processing the orders, and packaging and shipping everything out to the customer. Here at Divvy, we handle all your internal materials needs. When your business locations need uniforms, signage, promotional materials or even business cards, we take care of it for you. If you printed or produced materials on your own but you need storage space, shipping materials, extra employees and a whole lot more time, we can help out. We save you time and money with our streamlined process, so you can focus on your bottom line. 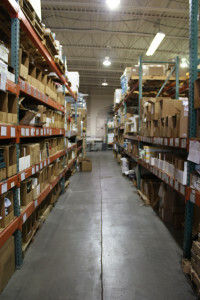 When users order through the Divvy webstore, we can get materials out the door within hours. We have the tools, materials and muscle to package and deliver your items quickly and efficiently. Because of our access to industry-leading materials and tools, the packaging we provide will look good, survive the journey and often weigh less than home-packed items. With our 45,000- square foot facility, team of fulfillment employees and large client base, we’ve got everything already in place to provide the services you need. Taking it on by yourself adds extra costs that you shouldn’t have to worry about. Since Divvy handles all the storage and shipping of your items, you’ll never have to take time out of your day to worry about shipping logistics. We are confident that we can help you grow your business by streamlining your ordering and delivery process. Contact us today to set up your Divvy webstore and start the fulfillment process.